This model was originally by Hachiroku24 as the flying car driven by the Weasley's in Harry Potter and the Chamber of Secrets. In real life, the car type used in the film was made by Ford for sale in the United Kingdom and was called the "Anglia". This particular version (a 105-E Super) was built from 1959 - 1968. I've wanted a accurate version of the flying car driven by the Weasley's in Harry Potter and the Chamber of Secrets. I have been doing this cycle of building, revising with newer parts, tearing apart, and repeat since 2002 when the original set 4728 (Escape from Privet Drive) was released. I changed the color from the original medium blue to black around 2004 and revised the wheel size around 2011. Now I have added a new style front end to the car via a design by Hachiroku24. 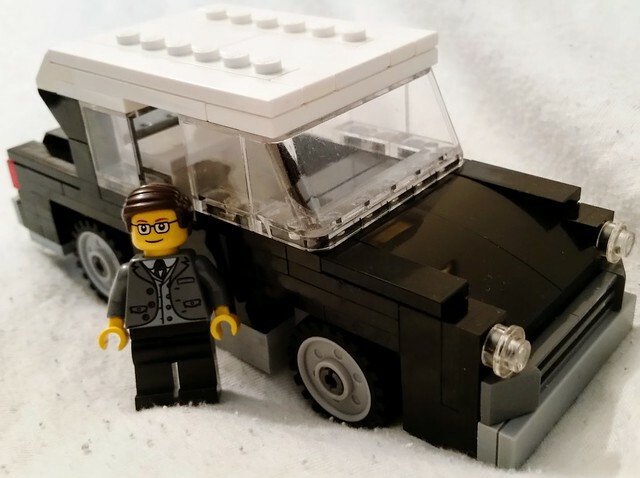 Oh, and the mini-figure in the picture is my sig-fig, which is NOT included with the car in the LDD file. 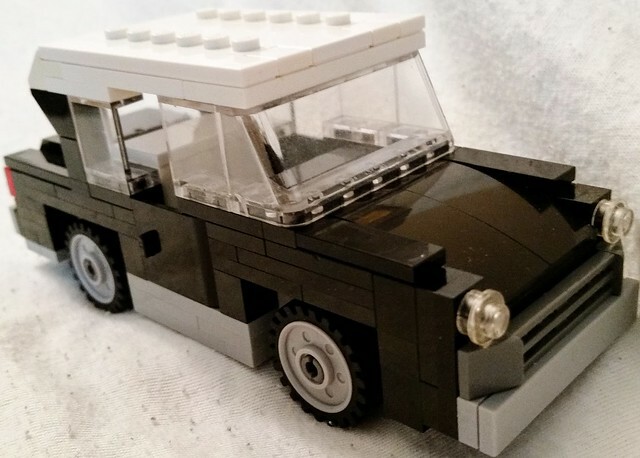 The car without my sig-fig. 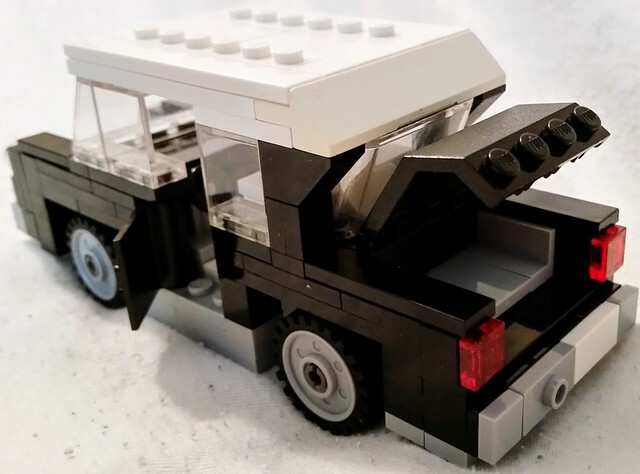 The car can seat two mini-figures on jumper plates, and also features opening doors and trunk with plenty of space. The rear of the car features a license plate and a jumper plate to represent the exhaust pipe. Here you can see the original Hachiroku24 model, which inspired me to revamp my car. If you want to build one of these according to the original designer, follow the instructions in video form in this topic here on Eurobricks. Comments, Questions, and Complaints are welcome, though any praise for the blue model and front bumper design should go to the original designer ( Hachiroku ) in his topic, as linked to above. 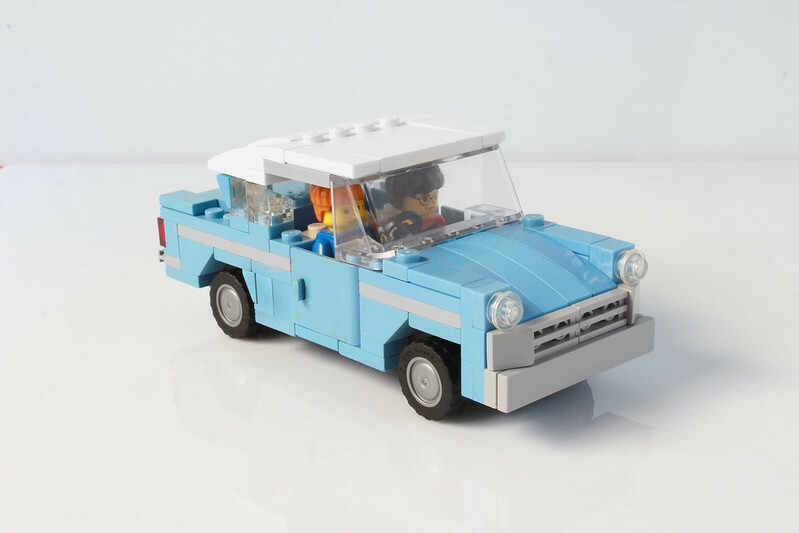 If you are looking for the LDD file for my car, here it is. UPDATE: Added a picture of Hachiroku24's car, and revised pictures of my model with his modified front bumper applied. The ldd file for my model has been added as well, but please note the real life pictures of my car will come tomorrow, as right now I'm exhausted and need to go to get some sleep. Real life pictures added, sorry for the three day wait. Fantastic, as a child in the 60`s I remember sitting behind the wheel of my uncle`s Anglia.................yes I`m that old .......................I love these nostalgic builds, thanks for sharing! !